The night before my adventure into Snowdonia National Park, I tried to imagine what the next week would bring since this was my first walking trip. 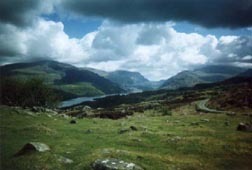 The route which The Wayfarers had chosen would take me through, magical, mystical, northern Wales. This land of untamed beauty offers a microcosm of extraordinary scenery, changing from one minute to the next. The following days would impart a transcendental experience as I learned some of the mysteries of this ancient land while making my way through the ever changing landscape. I would visit towns, villages, castles and farms which are incorporated into the park while experiencing all kinds of weather. On the first morning of the walk, I peered out my window to see a gray, threatening sky with a stiff wind blowing. As a Southern Californian, I have not leaned to deal with the elements and I presumed we would wait until the weather cleared before beginning our trek. Following breakfast, however, our group of twelve was out the door. In Wales, as they say, if you don’t like the weather, wait a couple of minutes and I discovered that to be true. My greatest allies were my sturdy boots and my all-weather gear which served me well in all kinds of conditions. The ground was wet from a night of rain as we made our way down the path from the hotel and continued along a wooded area until beginning a gradual climb up small grassy hill where several sheep grazed, stopping to peer at the interlopers. Curious baby lambs stood staring, then quickly rushed away to find their mothers. Before long, we were trudging along a grassy, muddy path between hand laid stone fences up and down undulating hills. We crossed over the stone walls via ladders and through them via “kissing gates.” The scenery abruptly changed from rugged to lush as we heard the sounds of rushing water and we followed alongside the Arthog waterfalls churning over rocks and boulders. The ground, covered in shimmering moss, gave the impression of a fairyland and my imagination took me to the possibility of seeing some sort of other worldly creature. We walked alongside the Mawddach Estuary and through the foothills of Cadair Idris which myth has it that if one sleeps on top of the mountain , they will go mad, die or become a poet. 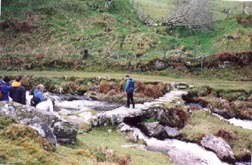 Continuing, we sloshed through bogs, climbed grassy hills, wandered through dales and moors, crept through dark woods, peered at ancient ruins, and crossed bridges over foaming currents. Along with the scenery, the weather changed and during most of our walk, the skies became bright and blue with dramatic cloud formations. During our walks, our fascinating guide paused to enchant us with tales of mysterious Druids and castles and Celtic history. He pointed out the colorful wildflowers which were just beginning to bloom….golden buttercups, dainty violets, heather and carpets of bluebells. He show us mistletoe, a strangling vine, and I wondered how it got such a romantic reputation. He spoke of the oak forests where the Druids dwelled and of their sacred Cregennen Lakes in Anglesey, northwest of Snowdonia, where ancient Celtic inhabitants came to throw their treasures into the lake to ensure good fortune. He told us of the advent of the breakaway religions and the chapels where non-Anglicans practiced their faiths. One afternoon, while we picnicked in the shadow of the mystical Mount Snowden, he pointed out Clogwyn du’Ardddu, the site of the first rock climb. The story goes that two Anglican clergyman who were also botanists, went in search of plant specimens and to further their botanical knowledge, inadvertently made the first recorded rock climb in history in 1798. They decided to go higher and higher in their search, were soon obliged to resort to climbing on hands and knees, moving from one crag to another until 600 feet up, they were on a sheer cliff and could go neither up nor down. Rev. Bingley, who wore the stronger pair of boots (with nails in them) made the first pitch and having fixed himself to a rock, took off his belt and holding firmly on one end, gave the other end to his friend, Rev. Williams, and with this method after an hour and a half found themselves “on the brow of a dreadful precipice, and in possession of all the plants we expected to gather.” By today’s standards, this sheer rock rates extremely high in difficulty even for expert climbers. I discovered that there are more castles, both ruined and still occupied, per square mile in Wales than anywhere else in Europe. Two of the towns we visited were known for their castles and we took time out from our countryside walks to explore the imposing gray stone citadels. The first, Harlech, was a fairy tale castle looking out to the sea, fairly small as castles go, but surrounded in mystery and romance. It was built in the 13th century by Edward I and sits 200 feet above the old sea level. The second, Caernarfon, one of Europe’s most famous castles, and another of King Edward’s creations, the site where Prince Charles was invested as the Crowned Prince of Wales, was a large, imposing structure with four giant towers visible from miles away. I breathlessly climbed to the very top of the narrow spiral staircase into the Queen’s Tower for a royal view of the surrounding area. I later visited the castle’s museum which focused mostly on the involvement of the Welsh in various wars, presented with videos, pictures and museum cases of medals and uniforms. Another outing took us through mysteriously dark woods where I couldn’t help but think of Hansel and Gretel. 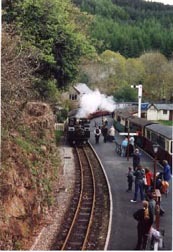 Just outside the forested area, we climbed the stone steps to a small railway station where we boarded an old fashioned narrow gauge steam train on the Ffestiniog Railway. Our destination, Portmerion, an Italianate village nestled on its own private peninsula on the southern shores of Snowdonia. It almost reminded me of Portofino. The village was a dream come true for its creator, Sir Clough Williams-Ellis who wanted to build his own ideal village on some romantic coastal site. Through the years it drew a celebrity clientele including George Bernard Shaw, H. G. Wells, Bertrand Russell, Noel Coward (who wrote Blythe Spirit there in 1941) and Frank Lloyd Wright. The Prisoner, a popular TV series which attained cult status, was filmed here. This tiny village continues as a popular spot for both locals and tourists who wandered through the town exploring the gardens, shops and galleries. At the country inns where we stayed, we met each evening for cocktails, excitedly discussing the day’s adventure before adjourning to the formal dining room for a sumptuous meal. During one evening we were entertained and enlightened by a charming professor of Welsh history, who, among other things, explained just why so many Welsh people are named Jones. A harpist played old Welsh melodies on an elaborate golden harp (the national instrument of Wales) while we sipped coffee in the salon after dinner one evening. Then we were off to bed in a beautiful country inn, dreaming of the next day’s adventure. On the final day of our walking tour, my new found friends and I feasted on a sumptuous picnic high on a hill, the sun brightly shining and in the distance, Mt. Snowden, for which the park was named, appeared though the lifting clouds in all its mystical glory. Wales remains a principality of unspoiled beauty. Snowdonia, a multi facetted jewel which, when explored on foot, enabled me to experience its natural treasures with all my senses and become one with them. British Airways: For the ultimate in luxury, British Airways First Class service is a vacation in itself. Roomy, comfortable chairs which, at bedtime, convert into cozy full-length beds complete with a soft down duvet and your own pajamas. Gourmet meals are beautifully presented on table-sized trays with linen and china. A thoroughly spoiling experience. Business Class and Economy Class are also available to Manchester via London..
BritRail: A comfortable and relaxing way to see the countryside en route to a United Kingdom destination, BritRail also offers packages which include sleepers, morning coffee or tea and amenities. BritRail is available from Manchester to Chester, the departure point for the Welsh walking trip. Cemlyn Restaurant and Tea Shop: Overlooking Harlech Castle, this immaculate restaurant and tea room is overseen by its proprietress who treats guests as if they were in her home. Well prepared, delicious food and fabulous tea selection. This is a non-smoking restaurant. Columbia Sporting Goods: Stylish, high-tech outdoor clothing not only looks good but can be one of a walker’s greatest allies through all kinds of weather. The versatile pants, vests, shirts, hats and jackets made of water-resistant, lightweight, breathable fabrics provide comfort and flexibility. Maes-y-Neuadd Country House Hotel: An ancient manor house, dating from the 14th century, is situated within ten acres of gardens including a walled organic kitchen garden with a view of Tremadog Bay. The individually designed and decorated rooms offer all the modern comforts including a cutting edge bathroom with oversized tubs. Outstanding dining room. Penmaenuchaf Hall: Originally built as a country house in 1860, features stunning views of the Rhinog mountains and Mawddach Estuary. This picturesque gray-stoned manor offers the charm of the old with the convenience of the new. Welcoming, warm public rooms. All guest rooms are individually and tastefully decorated and bathrooms are spacious and deluxe. Fine dining room. Portmeirion Hotel: Situated on a private peninsula at the water’s edge, Hotel Portmeirion matches the eclectic nature of its surroundings. Decor and furnishing in both public and guest rooms are based on various themes with precious antiques throughout. Fine dining room. The Wayfarers: The world’s first luxury country walking tour, established more than 20 years ago, now offers adventures, at several levels and suitable for various abilities and age groups, throughout the United Kingdom, Europe, North America and the Pacific Rim. The Wayfarer way to walk embraces high standards of lodging, meals, personal service and always spectacular scenery. The cost does not include transportation.